One of the main reasons why people prefer cloud phone systems over landlines is that they can throw away their desk phones and use their mobile devices and/or computers instead. Granted, you can save a lot of money this way, but keeping your desk phones or replacing them with VoIP-compatible units has many pros. The use of analog or IP phones with your VoIP service holds many advantages, aside from just being ergonomically more comfortable for the person handling incoming and outgoing calls throughout the day. 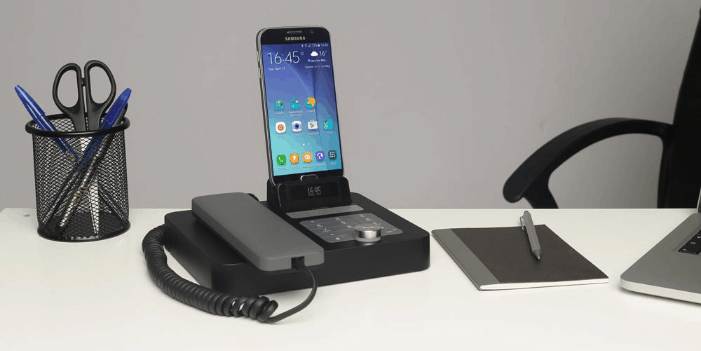 Next to the classic-looking desktop phones there are clever mobile desk mount units that let you turn your smartphone into a full-fledged desk phone. Whichever desktop phone solution you prefer, there is usually the choice between purchasing and renting your phone units, the latter giving you the opportunity to discover which phone hardware works best for your phone system. Desk phones are still the most reliable and comfortable way of handling voice-only communication. Furthermore, aside from slight design changes over the past decades, the basics of a telephone haven’t changed since its invention. In other words, less tech-savvy people can easily operate even more complicated devices. 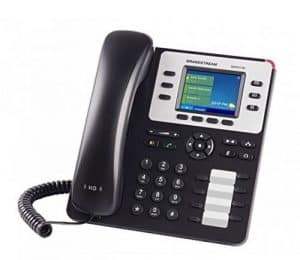 You have the option to choose a regular desk phone with extra hard keys to forward, merge, transfer, hold calls; cordless phones for mobility within a certain range; conference phones for meetings and many more. And as we mentioned in our article dedicated to headsets for VoIP, most phones can be used with headsets or, you can put callers on speaker if you prefer the traditional approach. 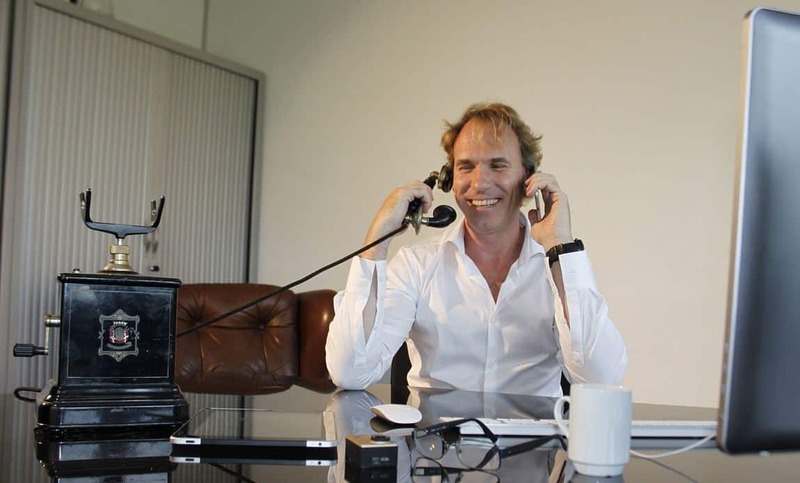 However, there is a catch with desk phones: they are not compatible with VoIP, unless you buy an IP phone or purchase an analog phone adapter (ATA). Furthermore, desk phones still have to be integrated into a physical/cloud PBX to be able to host separate extensions/lines. And let’s not forget that cordless phone docking stations need their own power source. Desk phones are separate “entities”, therefore they must be configured once installed. However, if you have hundreds if not thousands of contacts, there is a pretty clever solution: turn your mobile phone into your desk phone with a desk mount like the Invoxia NVX 200. By purchasing such a unit, you only have to connect your mobile device (iOS, Android or Blackberry smartphone or tablet) with the mount via Bluetooth connection and voilà, you have a desk phone with the capabilities of your smart device at your fingertips. Desk mounts also work as speakers, makeshift video conference phones, phone chargers and, in certain cases, as full-fledged VoIP desk phones. Although they advertise themselves as comfortable complementary with featherweight and radiation-free handsets, these mobile desk mounts are extremely pricy: the above featured NVX 200 sells for $249. Since desk and conference phones are essential parts of any phone system, many VoIP service providers offer their clients the option to purchase phones as well. The range of available devices is enormous: you can buy phones with a mono- or polychrome screen, with or without touchscreen. There are regular desk phones with or without expansion modules, cordless or conference devices, phones with audio jacks and ATAs. Furthermore, VoIP companies always pre-configure these devices before shipping and even offer the option to not buy, but rather rent phones for a monthly fee. However, due to being preconfigured, phones purchased from VoIP companies are always more expensive. Furthermore, it is very likely they are locked too, meaning you cannot use them with other providers. Therefore, opt for buying your desk phone hardware from other retailers like Amazon, where most of the devices are available for cost-friendlier prices. 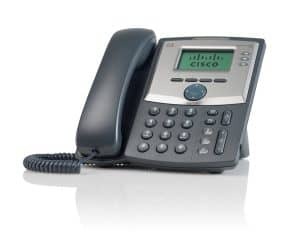 Probably the best-known and most widespread IP phone in the world, the Cisco SPA 303 provides every necessary feature at a brutally affordable price ($57.86 at Amazon). The phone comes with caller ID screening on a monochrome screen, automatic redial, intercom, voicemail, call waiting, forwarding, transferring and holding, a speaker, 10 function buttons, 3 of which are programmable. The SPA 303 stores up to 100 names and numbers, logs 60 missed calls, support up to 4 lines, has 3 indicator signals and even provides 3-way conferencing and a 2.5mm audio jack for headphones. To top it all, this device is not only hearing aid compatible, but it also supports firmware upgrades. The second most expensive phone of the three ($67.95 at Amazon), Grandstream’s GXP2130 desk phone comes with a neat little holder with which you can have your phone “stand up” on your desk in a 45-degree angle. The GXP2130 also features a 2.8” LCD color-screen and the Power over Ethernet (PoE) function. The phone supports 3 phone lines and 3 SIP accounts, it provides HD quality regarding calls and even has Bluetooth to be connected to headsets and to fetch contact lists from paired mobile devices. The 8 speed-dial keys allow you to monitor the status of other extensions and to transfers/forward calls, but you also have the option to program 4 context-sensitive soft keys. And as a nice little addition, GXP2130s can even include weather and currency exchange apps to be displayed on the phone’s screen. Polycom’s mid-range IP phone is a brutal powerhouse that comes with a jaw-dropping $124 price tag at Amazon. 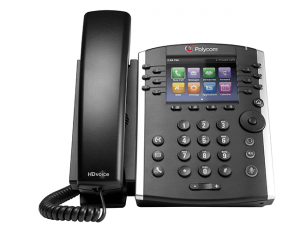 However, for that price you will be treated like a king: the Polycom VVX 410 can host up to 12 phone lines with their respective hard keys, has a 3.5” TFT screen and supports multiple languages and even Asian characters. The phone has additional keys to mute, hold or transfer HD calls, manage the volume, and return to the home screen. Each VVX 410 comes with the option to add up to 3 expansion modules, complete voicemail support, 3-day audio conferencing and, most importantly, interoperability with Skype for Business and Office 365.